Question: What about sleep? How much should I sleep? Answer: Don't ask me, I can't tell you. A good average for someis four hours a night. What is important, though, is that you watch andknow yourself. If you try to go with too little sleep, the body will feel uncomfortable and mindfulness will be difficult to sustain. Too much sleep leads to a dull or a restless mind. Find the natural balance for yourself. Carefully watch the mind and body and keep track of sleep needs until you find the optimum. If you wake up and then roll over for a snooze, this is defilement. Establish mindfulness as soon as your eyes open. Q: How about eating? How much should I eat? Answer: Look at your food as medicine. Are you eating so much that you only feel sleepy after the meal and are you getting fatter every day? Stop! Examine your own body and mind. There is no need to fast. Instead, experiment with the amount of food you take. Find the natural balance for your body. Put all your food together in your bowl following the ascetic practice. Then you can easily judge the amount you take. Watch yourself carefully as you eat. Know yourself. The essence of our practice is just this. There is nothing special you must do. Only watch. Examine yourself. Watch the mind. Then you will know what is the natural balance for your own practice. Q: Are minds of Asians and Westerners different? Answer: Basically there is no difference. Outer customs and language may appear different, but the human mind has natural characteristics which are the same for all people. Greed and hatred are the same in an Eastern or a Western mind. Suffering and the cessation of suffering are the same for all people. Q: Is it advisable to read a lot or study the scriptures as a part of practice? Answer: The Dhamma of the Buddha is not found in books. If you want to really see for yourself what the Buddha was talking about, you don't need to bother with books. Watch your own mind. Examine to see how feelings come and go, how thoughts come and go. don't be attached to anything. Just be mindful of whatever there is to see. This is the way to the truths of the Buddha. Be natural. Everything you do in your life here is a chance to practise. It is all Dhamma. When you do your chores, try to be mindful. If you are emptying a spittoon or cleaning a toilet, don't feel you are doing it as a favour for anyone else. There is Dhamma in emptying spittoons. Don't feel you are practising only when sitting still, cross-legged. Some of you have complained that there is not enough time to meditate. Is there enough time to breathe? This is your meditation: mindfulness, naturalness in whatever you do. Q: Why don't we have daily interviews with the teacher? Answer: If you have any questions, you are welcome to come and ask them anytime. But we don't need daily interviews here. If I answer your every little question, you will never understand the process of doubt in your own mind. It is essential that you learn to examine yourself, to interview yourself. Listen carefully to the lecture every few days, then use this teaching to compare with your own practice. Is it still the same? Is it different? Why do you have doubts? Who is it that doubts? Only through self-examination can you understand. Q: Sometimes I worry about the monks' discipline. If I kill insects accidentally, is this bad? Answer: Sila or discipline and morality are essential to our practice,but you must not cling to the rules blindly. In killing animals or in breaking other rules, the important thing is intention. Know your own mind. You should not be excessively concerned about the monks' discipline. If it is used properly, it supports the practice, but some monks are so worried about the petty rules that they can't sleep well. Discipline is not to be carried as a burden. In our practice here the foundation is discipline, good discipline plus the ascetic rules and practices. Being mindful and careful of even the many supporting rules as well as the basic 227 precepts has great benefit. It makes life very simple. There need be no wondering about how to act, so you can avoid thinking and instead just be simply mindful. The discipline enables us to live together harmoniously; the community runs smoothly. Outwardly everyone looks and acts the same. Discipline and morality are the stepping stones for further concentration and wisdom. By proper use of the monks' discipline and the ascetic precepts, we are forced to live simply, to limit our possessions. So here we have the complete practice of the Buddha: refrain from evil and do good, live simply keeping to basic needs, purify the mind. That is, be watchful of our mind and body in all postures: sitting, standing, walking or lying, know yourself. Q: What can I do about doubts? Some days I'm plagued with doubts about the practice or my own progress, or the teacher. Answer: Doubting is natural. Everyone starts out with doubts. You can learn a great deal from them. What is important is that you don't identify with your doubts: that is, don't get caught up in them. This will spin your mind in endless circles. Instead, watch the whole process of doubting, of wondering. See who it is that doubts. See how doubts come and go. Then you will no longer be victimized by your doubts. You will step outside of them and your mind will be quiet. You can see how all things come and go. Just let go of what you are attached to. Let go of your doubts and simply watch. This is how to end doubting. Q: What about other methods of practice? These days there seem to be so many teachers and so many different systems of meditation that it is confusing. Answer: It is like going into town. One can approach from the north,from the southeast, from many roads. Often these systems just differ outwardly. Whether you walk one way or another, fast or slow, if you are mindful, it is all the same. There is one essential point that all good practice must eventually come to--not clinging. In the end, all meditation systems must be let go of. Neither can one cling to the teacher. If a system leads to relinquishment, to not clinging, then it is correct practice. You may wish to travel, to visit other teachers and try other systems.Some of you have already done so. This is a natural desire. You will find out that a thousand questions asked and knowledge of many systems will not bring you to the truth. Eventually you will get bored. You will see that only by stopping and examining your own mind can you find our what the Buddha talked about. No need to go searching outside yourself. Eventually you must return to face your own true nature. Here is where you can understand the Dhamma. Q: A lot of times it seems that many monks here are not practising. They look sloppy or unmindful. This disturbs me. Answer: It is not proper to watch other people. This will not help your practice. If you are annoyed, watch the annoyance in your own mind. If others' discipline is bad or they are not good monks, this is not for you to judge. You will not discover wisdom watching others. Monks' discipline is a tool to use for your own meditation. It is not a weapon to use to criticize or find fault. No one can do your practice for you, nor can you do practice for anyone else. Just be mindful of your own doings. This is the way to practice. Q: I have been extremely careful to practise sense restraint. I always keep my eyes lowered and am mindful of every little action I do. When eating, for example, I take a long time and try to see each touch: chewing, tasting, swallowing, etc. I take each step very deliberately and carefully. Am I practising properly? Answer: Sense restraint is proper practice. We should be mindful of it throughout the day. But don't overdo it! Walk and eat and act naturally. And then develop natural mindfulness of what is going on within yourself. Don't force your meditation nor force yourself into awkward patterns. This is another form of craving. Be patient. Patience and endurance are necessary. If you act naturally and are mindful, wisdom will come naturally too. Q: Is it necessary to sit for very long stretches? Answer: No, sitting for hours on end is not necessary. Some people think that the longer you can sit, the wiser you must be. I have seen chickens sit on their nests for days on end! Wisdom comes from being mindful in all postures. Your practice should begin as you awaken in the morning. It should continue until you fall asleep. Don't be concerned about how long you can sit. What is important is only that you keep watchful whether you are working or sitting or going to the bathroom. Each person has his own natural pace. Some of you will die at age fifty, some at age sixty-five, and some at age ninety. So, too, your practice will not be all identical. Don't think or worry about this. Try to be mindful and let things take their natural course. Then your mind will become quieter and quieter in any surroundings. It will become still like a clear forest pool. Then all kinds of wonderful and rare animals will come to drink at the pool. You will see clearly the nature of all things (sankharas) in the world. You will see many wonderful and strange things come and go. But you will be still. Problems will arise and you will see through them immediately. This is the happiness of the Buddha. Q: I still have very many thoughts. My mind wanders a lot even though I am trying to be mindful. Answer: Don't worry about this. Try to keep your mind in the present. Whatever there is that arises in the mind, just watch it. Let go of it. Don't even wish to be rid of thoughts. Then the mind will reach its natural state. No discriminating between good and bad, hot and cold, fast and slow. No me and no you, no self at all. Just what there is. When you walk on alms-round, no need to do anything special. Simply walk and see what there is. No need to cling to isolation or seclusion. Wherever you are, know yourself by being natural and watching. If doubts arise, watch them come and go. It's very simple. Hold on to nothing. It is as though you are walking down a road. Periodically you will run into obstacles. When you meet defilements, just see them and just overcome them by letting go of them. don't think about the obstacles you have passed already. Don't worry about those you have not yet seen. Stick to the present. Don't be concerned about the length of the road or about the destination. Everything is changing. Whatever you pass, do not cling to it. Eventually the mind will reach its natural balance where practice is automatic. All things will come and go of themselves. Q: Have you ever looked at the Altar Sutra of the 6th Patriarch, Hui Neng? Answer: Hui Neng's wisdom is very keen. It is very profound teaching,not easy for beginners to understand. But if you practise with our discipline and with patience, if you practise not-clinging, you will eventually understand. Once I had a disciple who stayed in a grass-roofed hut. It rained often that rainy season and one day a strong wind blew off half the roof. He did not bother to fix it, just let it rain in. Several days passed and I asked him about his hut. He said he was practising not-clinging. This is not-clinging without wisdom. It is about the same as the equanimity of a water buffalo. If you live a good life and live simply, if you are patient and unselfish, you will understand the wisdom of Hui Neng. Q: You have said that samatha and vipassana or concentration and insight are the same. Could you explain this further? Answer: It is quite simple. Concentration (samatha) and wisdom (vipassana) work together. First the mind becomes still by holding on to a meditation object. It is quiet only while you are sitting with your eyes closed. This is samatha and eventually this samadhi-base is the cause for wisdom or vipassana to arise. Then the mind is still whether you sit with your eyes closed or walk around in a busy city. It's like this. Once you were a child. Now you are an adult. Are the child and the adult the same person? You can say that they are, or looking at it another way, you can say that they are different. In this way samatha and vipassana could also be looked at as separate. Or it is like food and feces. Food and feces could be called the same and they can be called different. Don't just believe what I say, do your practice and see for yourself. Nothing special is needed. If you examine how concentration and wisdom arise, you will know the truth for yourself. These days many people cling to the words. They call their practice vipassana. Samatha is looked down on. Or they call their practice samatha. It is essential to do samatha before vipassana, they say. All this is silly. Don't bother to think about it in this way. Simply do the practice and you'll see for yourself. Q: Is it necessary to be able to enter absorption in our practice? Answer: No, absorption is not necessary. You must establish a modicum of tranquillity and one-pointedness of mind. Then you use this to examine yourself. Nothing special is needed. If absorption comes in your practice, this is OK too. Just don't hold on to it. Some people get hung up with absorption. It can be great fun to play with. You must know proper limits. If you are wise, then you will know the uses and limitations of absorption, just as you know the limitations of children verses grown men. Q: Why do we follow the ascetic rules such as only eating out of our bowls? Answer: The ascetic precepts are to help us cut defilement. By following the ones such as eating out of our bowls we can be more mindful of our food as medicine. If we have no defilements, then it does not matter how we eat. But here we use the form to make our practice simple. The Buddha did not make the ascetic precepts necessary for all monks, but he allowed them for those who wished to practise strictly. They add to our outward discipline and thereby help increase our mental resolve and strength. These rules are to be kept for yourself. Don't watch how others practise. Watch your own mind and see what is beneficial for you. The rule that we must take whatever meditation cottage assigned to us is a similarly helpful discipline. It keeps monks from being attached to their dwelling place. If they go away and return, they must take a new dwelling. This is our practice--not to cling to anything. Q: If putting everything together in our bowls is important, why don't you as a teacher do it yourself? Don't you feel it is important for the teacher to set an example? Answer: Yes, it is true, a teacher should set an example for his disciples. I don't mind that you criticize me. Ask whatever you wish. But it is important that you do not cling to the teacher. If I were absolutely perfect in outward form, it would be terrible. You would all be too attached to me. Even the Buddha would sometimes tell his disciples to do one thing and then do another himself. Your doubts in your teacher can help you. You should watch your own reactions. Do you think it is possible that I keep some food out of my bowl in dishes to feed the laymen who work around the temple? Wisdom is for yourself to watch and develop. Take from the teacher what is good. Be aware of your own practice. If I am resting while you must all sit up, does this make you angry? If I call the color blue red or say that male is female, don't follow me blindly. One of my teachers ate very fast. He made noises as he ate. Yet he told us to eat slowly and mindfully. I used to watch him and get very upset. I suffered, but he didn't! I watched the outside. Later I learned. Some people drive very fast but carefully. Others drive slowly and have many accidents. Don't cling to rules, to outer form. If you watch others at most ten percent of the time and watch yourself ninety percent, this is the proper practice. 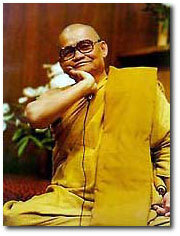 At first I used to watch my teacher Ajahn Tong Raht and had many doubts. People even thought he was mad. He would do strange things or get very fierce with his disciples. Outside he was angry, but inside there was nothing. Nobody there. He was remarkable. He stayed clear and mindful until the moment he died. Looking outside the self is comparing, discriminating. You will not find happiness that way. Nor will you find peace if you spend your time looking for the perfect man or the perfect teacher. The Buddha taught us to look at the Dhamma, the truth, not to look at other people. Q: How can we overcome lust in our practice? Sometimes I feel as if I am a slave to my sexual desire. Answer: Lust should be balanced by contemplation of loathesomeness. Attachment to bodily form is one extreme and one should keep in mind the opposite. Examine the body as a corpse and see the process of decay or think of the parts of the body such as the lungs, spleen, fat, feces, and so forth. Remember these and visualize this loathesome aspect of the body when lust arises. This will free you from lust. Q: How about anger? What should I do when I feel anger arising? Answer: You must use loving-kindness. When angry states of mind arise in meditation, balance them by developing feelings of loving-kindness. If someone does something bad or gets angry, don't get angry yourself. If you do, you are being more ignorant than they. Be wise. Keep in mind compassion, for that person is suffering. Fill your mind with loving-kindness as if he were a dear brother. Concentrate on the feeling of loving-kindness as a meditation subject. Spread it to all beings in the world. Only through loving-kindness is hatred overcome. Sometimes you may see other monks behaving badly. You may get annoyed. This is suffering unnecessarily. It is not yet our Dhamma. You may think like this: "He is not as strict as I am. They are not serious meditators like us. Those monks are not good monks. "; This is a great defilement on your part. Do not make comparisons. Do not discriminate. Let go of your opinion as watch your opinions and watch yourself. This is our Dhamma. You can't possibly make everyone act as you wish or be like you. This wish will only make you suffer. It is a common mistake for meditators to make, but watching other people won't develop wisdom. Simply examine yourself,your feelings. This is how you will understand. Q: I feel sleepy a great deal. It makes it hard to meditate. Answer: There are many ways to overcome sleepiness. If you are sitting in the dark, move to a lighted place. Open your eyes. Get up and wash your face or take a bath. If you are sleepy, change postures. Walk a lot. Walk backwards. The fear of running into things will keep you awake. If this fails, stand still, clear the mind and imagine it is full daylight. Or sit on the edge of a high cliff or deep well. You won't dare sleep! If nothing works, then just go to sleep. Lay down carefully and try to be aware until the moment you fall asleep. Then as you awaken, get right up. Don't look at the clock or roll over. Start mindfulness from the moment you awaken. If you find yourself sleepy everyday, try to eat less. Examine yourself. As soon as five more spoonfuls will make you full, stop. Then take water until just properly full. Go and sit. Watch your sleepiness and hunger. You must learn to balance your eating. As your practice goes on you will feel naturally more energetic and eat less. But you must adjust yourself. Q: Why must we do so much prostrating here? Answer: Prostrating is very important. It is an outward form that is part of practice. This form should be done correctly. Bring the forehead all the way to the floor. Have the elbows near the knees and the palms of the hands on the floor about three inches apart. Prostrate slowly, be mindful of your body. It is a good remedy for our conceit. We should prostrate often. When you prostrate three times you can keep in mind the qualities of the Buddha, the Dhamma and the Sangha, that is, the qualities of mind of purity, radiance and peace. So we use the outward form to train ourselves. Body and mind become harmonious. don't make the mistake of watching how others prostrate. If young novices are sloppy or the aged monks appear unmindful, this is not for you to judge. People can be difficult to train. Some learn fast but others learn slowly. Judging others will only increase your pride. Watch yourself instead. Prostrate often, get rid of your pride. Those who have really become harmonious with the Dhamma get far beyond the outward form. Everything they do is a way of prostrating. Walking, they prostrate; eating, they prostrate; defecating, they prostrate. This is because they have got beyond selfishness. Q: What is the biggest problem of your new disciples? Answer: Opinions. views and ideas about all things. About themselves, about practice, about the teachings of the Buddha. Many of those who come here have a high rank in the community. There are wealthy merchants or college graduates, teachers and government officials. Their minds are filled with opinions about things. They are too clever to listen to others. It is like water in a cup. If a cup is filled with dirty, stale water, it is useless. Only after the old water is thrown out can the cup become useful. You must empty your minds of opinions, then you will see. Our practice goes beyond cleverness and beyond stupidity. If you think;"I am clever, I am wealthy, I am important, I understand all about Buddhism. "; You cover up the truth of anatta or no-self. All you will see is self, I, mine. But Buddhism is letting go of self. Voidness, Emptiness, Nibbana. Q: Are defilements such as greed or anger merely illusory or are they real? Answer: They are both. The defilements we call lust or greed, or anger or delusion, these are just outward names, appearances. Just as we call a bowl large, small, pretty, or whatever. This is not reality. It is the concept we create from craving. If we want a big bowl, we call this one small. Craving causes us to discriminate. The truth, though, is merely what is. Look at it this way. Are you a man? You can say 'yes'. This is the appearance of things. But really you are only a combination of elements or a group of changing aggregates. If the mind is free, it does not discriminate. No big and small, no you and me. There is nothing: Anatta, we say, or non-self. Really, in the end there is neither atta nor anatta. Q: Could you explain a little more about karma? Answer: Karma is action. Karma is clinging. Body, speech, and mind all make karma when we cling. We make habits. These can make us suffer in the future. This is the fruit of our clinging, of our past defilement. All attachment leads to making karma. Suppose you were a thief before you became a monk. You stole, made others unhappy, made your parents unhappy. Now you are a monk, but when you remember how you made others unhappy, you feel bad and suffer yourself even today. Remember, not only body, but speech and mental action can make conditions for future results. If you did some act of kindness in the past and remember it today, you will be happy. This happy state of mind is the result of past karma. All things are conditioned by cause--both long term and, when examined, moment to moment. But you need not bother to think about past, or present, or future. Merely watch the body and mind. You must figure karma out for yourself. Watch your mind. Practise and you will see clearly. Make sure, however, that you leave the karma of others to them. Don't cling to and don't watch others. If I take a poison, I suffer. No need for you to share it with me! Take what is good that your teacher offers. Then you can become peaceful, your mind will become like that of your teacher. If you will examine it, you will see. Even if now you don't understand, when you practise, it will become clear. You will know by yourself. This is called practising the Dhamma. When we were young, our parents used to discipline us and get angry. Really they wanted to help us. You must see it over the long term. Parents and teachers criticize us and we get upset. Later on we see why. After long practise you will know. Those who are too clever leave after a short time. They never learn. You must get rid of your cleverness. If you think yourself better than others, you will only suffer. What a pity. No need to get upset. Just watch. Q: Sometimes it seems that since becoming a monk I have increased my hardships and suffering. Answer: I know that some of you have had a background of material comfort and outward freedom. By comparison, now you live an austere existence. Then in the practice, I often make you sit and wait for long hours. Food and climate are different from your home. But everyone must go through some of this. This is the suffering that leads to the end of suffering. This is how you learn. When you get angry and feel sorry for yourself, it is a great opportunity to understand the mind. The Buddha called defilements our teachers. All my disciples are like my children. I have only loving kindness and their welfare in mind. If I appear to make you suffer, it is for your own good. I know some of you are well-educated and very knowledgeable. People with little education and worldly knowledge can practise easily. But it is as if you Westerners have a very large house to clean. When you have cleaned the house, you will have a big living space. You can use the kitchen, the library, the living room. You must be patient. Patience and endurance are essential to our practice. When I was a young monk I did not have it as hard as you. I knew the language and was eating my native food. Even so, some days I despaired. I wanted to disrobe or even commit suicide. This kind of suffering comes from wrong views. When you have seen the truth, though, you are free from views and opinions. Everything becomes peaceful. Q: I have been developing very peaceful states of mind from meditation. What should I do now? Answer: This is good. Make the mind peaceful, concentrated. Use this concentration to examine the mind and body. When the mind is not peaceful, you should also watch. Then you will know true peace. Why? Because you will see impermanence. Even peace must be seen as impermanent. If you are attached to peaceful states of mind you will suffer when you do not have them. Give up everything, even peace. Q: Did I hear you say that you are afraid of very diligent disciples? Answer: Yes, that's right. I am afraid. I am afraid that they are too serious. They try too hard, but without wisdom. They push themselves into unnecessary suffering. Some of you are determined to become enlightened. You grit your teeth and struggle all the time. This is trying too hard. People are all the same. They don't know the nature of things (sankhara). All formations, mind and body, are impermanent. Simply watch and don't cling. Others think they know. They criticize, they watch, they judge. That's OK. Leave their opinions to the. This discrimination is dangerous. It is like a road with a very sharp curve. If we think others are worse or better or the same as us, we go off the curve. If we discriminate, we will only suffer. Q: I have been meditating many years now. My mind is open and peaceful in almost all circumstances. Now I would like to try to backtrack and practise high states of concentration or mind absorption. Answer: This is fine. It is beneficial mental exercise. If you have wisdom, you will not get hung up on concentrated states of mind. It is the same as wanting to sit for long periods. This is fine for training, but really, practice is separate from any posture. It is a matter of directly looking at the mind. This is wisdom. When you have examined and understood the mind, then you have the wisdom to know the limitations of concentration, or of books. If you have practised and understand not-clinging, you can then return to the books. They will be like a sweet dessert. They can help you to teach others. Or you can go back to practise absorption. You have the wisdom to know not to hold on to anything. Q: Would you review some of the main points of our discussion? Answer: You must examine yourself. Know who you are. Know your body and mind by simply watching. In sitting, in sleeping, in eating, know your limits. Use wisdom. The practise is not to try to achieve anything. Just be mindful of what is. Our whole meditation is looking directly at the mind. You will see suffering, its cause and its end. But you must have patience; much patience and endurance. Gradually you will learn. The Buddha taught his disciples to stay with their teachers for at least five years. You must learn the values of giving, of patience and of devotion. Don't practise too strictly. Don't get caught up with outward form. Watching others is bad practice. Simply be natural and watch that. Our monks' discipline and monastic rules are very important. They create a simple and harmonious environment. Use them well. But remember, the essence of the monks' discipline is watching intention, examining the mind. You must have wisdom. don't discriminate. Would you get upset at a small tree in the forest for not being tall and straight like some of the others? This is silly. Don't judge other people. There are all varieties. No need to carry the burden of wishing to change them all. So, be patient. Practice morality. Live simply and be natural. Watch the mind. This is our practice. It will lead you to unselfishness. To peace. Any reproduction, in whole or part, in any form, for sale, profit or material gain, is prohibited. PRINTED FOR FREE DISTRIBUTION through the generosity of the devoted Buddhists of Thailand.